Keeping a check on your oxygen level and heart rate is becoming easier with the improvements in technology. In the past, the hospital was the only place where your blood oxygen concentration could be monitored. Today, oximeters are amongst the most common medical devices, inexpensive and portable, allowing for readings anywhere. Now, it’s even simpler to monitor your SpO2 concentration by turning your smartphone or tablet into an oximeter. The Kenek iPhone Oximeter allows you to turn your iPhone, iPad or iOS device into a fully functional digital oximeter. Developed by doctors and engineers, the Kenek is not only simple to use – requiring no separate power source for the oximeter and one-touch operation – but powerful, offering tracking and monitoring options found on oximeters which cost several times more. The Kenek iPhone Oximeter is a non-invasive, fingertip, and portable device that can be taken with you no matter where you go with your smartphone. All you need to do is download the app onto your iPhone, iPad, or iPod, plug in the oximeter into the headphone jack, and get your readings. The Kenek Edge app stores several months of data and offers historical data, trending, and the ability to send your information to a medical professional. No network connection required, no batteries, and the Kenek Edge application is completely free. If you’re looking for an affordable oximeter device with plenty of features, the Kenek Edge delivers. 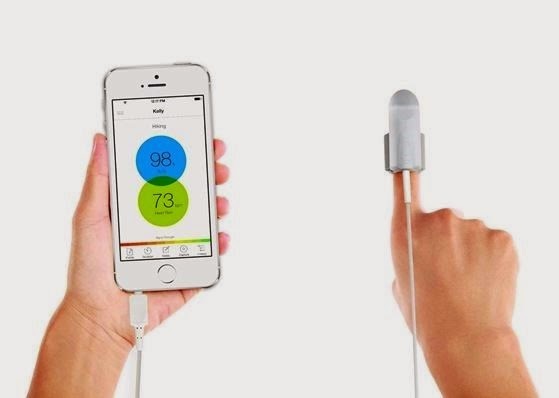 The Kenek iPhone Oximeter is compatible with any iOs version 7 and later. The Kenek Edge app can be used on the iPhone 4, 4S, 5, 5 C&S. In case you want to save up on your phone battery, the oximeter can also be used with the iPad 2, 3, Air, Mini, Mini Retina and also the iPod Touch 5. Don’t wait any longer to keep your health in check. Get the Kenek iPhone Oximeter today for just $44.95 from Concord Health Supply.